The iPhone 7 may go down in history as The One That Didn't Have The Headphone Jack. But there are other reasons for it to be considered a memorable part of the iPhone's lineage. Addition to hearing an audible ring when a call comes in, you can also turn on Vibrate on Ring. (Settings > Sounds & Haptics > Vibrate). What this will do is give you tactile feedback that someone's calling in addition to hearing the ringer. buzzing in your pocket. Especially if you are in a very noisy environment. This is a real boon for accessibility. With the"tactile" interface Apple has make the iPhone more accessible. With the iPhone 6s and especially the iPhone 7, Apple has further utilized its Taptic Engine in various ways across iOS that make using the device an even more pleasant and enriching experience. The iPhone 6s last year introduced 3D Touch. With Quick Actions and Peek & Pop, users could use their favorite apps more quickly and efficiently, all with a subtle buzz from the Taptic Engine. But 3D Touch also was interesting from an accessibility point of view as well: Not only is 3D Touch convenient, it can save users from eye strain and/or muscle fatigue due to excessive searching and tapping. With the iPhone 7 and iOS 10, Apple has expanded both 3D Touch's scope and how haptic feedback responds throughout the operating system. You can now use 3D Touch on certain icons in Control Center, as well as manage the status of downloading apps. On the iPhone 6s and 7, you feelControl Center or Notification Center being invoked with a quick thud as you slide the pane up or down; on the iPhone 7, the date picker in the Clock app registers bits of feedback as you move through time. Even enabling or disabling setting toggles now include a physical tick. The effects of the iPhone 7's Taptic Engine are pervasive and add another layer of interaction. This can bring complexity, yes — but for many people with disabilities, being able to literally feel your way through the OS means a lot. To see the green "on" indicator for iOS 10's settings switches is one thing; to see green and feel the status change as you slide it over is a horse of a different color. If you, like me, can't see so well, that literal feeling of reassurance makes all the difference. It isn't just Apple's internal apps, either: The Taptic Engine API for iPhone 7 gives third-party developers the power to enhance their apps to make them even more engaging and accessible than they already are. No discussion of the iPhone 7 and haptic feedback is complete without mention of another of its banner features: the solid state Home button. The Home button really is a "button" in name only: Unlike the physical buttons of yore, the iPhone 7's Home button no longer works mechanically. Instead, Apple uses its Taptic Engine to render "clicks" of varying degrees. (Users can determine which degree they prefer — 1, 2, or 3 — in a way similar to how 3D Touch is configured.) It reminds me a lot of the Force Touch trackpads on the 12-inch MacBook and the MacBook Pros. Another advantage is the haptic feedback: When you press the button to go back to Springboard, invoke Siri, or whatever else, it "buzzes." Again, it's all about multi-sensory output: Not only do users see the UI switching back to, say, the Home screen, they also feel a little buzz that lets them know the action (returning Home) has been triggered. That extra cue is a huge win for accessibility and key to the bimodal experience. If you can't see well, the Taptic Engine is still there for you, saying "Yes, you pushed the button. Something will happen now." It should be noted that, because needs and tolerances vary widely, not everyone with a disability will reap benefit from haptic feedback. Someone with autism who may be sensitive in terms of sensory motor development likely won't appreciate the iPhone 7's ticks and buzzes. But that's why you can disable System Haptics: You can configure the best experience for your needs. Still, in my brief time with an iPhone 7 Plus, I'm very much enjoying the use of haptic feedback throughout the device. As with Apple Watch, the Taptic Engine gives me a more immersive, enjoyable, and — most importantly — accessible experience. There are areas where it can improve; I'd love to get feedback when I tap a Back button, for instance. But overall, I'm bullish on Apple's and developers' future plans for this technology. 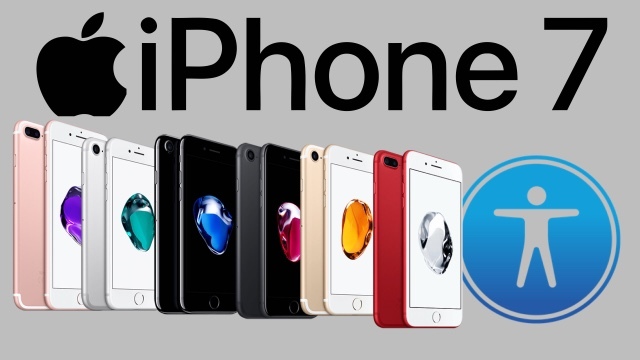 iPhone still owns the position of a high end smartphone in the market and with its unique features it will continue to do so in the future. This is just a fabulous blog as I was looking for right information on Wholesale Store for Cell Phone Accessories and found your blog really awesome. It is true that IPhone7 plus Light up Case is a nice way to have a cut on the cost. There are a lot of companies that are selling Cell Phone Accessories Wholesale USA, but finding one reliable is really hard. I found your website via Google while searching for a Cell Accessories Wholesale, your website came up, it looks great. Thanks for your article and keep publishing more informative content!! iPhone 8/8 Plus vs iPhone 7/7 Plus - Worth Upgrading? - Features, Cameras, Speed, Battery & Full Comparison. A tech blog to inform everyone.